There is so much about this book that I was so excited about! The cover itself is lovely and begs to be read. The idea of the book is fantastic. Marriage advice from around the world is an intriguing thought. Who doesn’t want to live happily ever after? The book begins in California with a brief introduction on how Fawn Weaver began to think about a journey to uniting happy wives and discovering what it was that made them happy. Her first interview with a widow left me anticipating what other wives might have to say. As I continued reading I became a little disappointed. 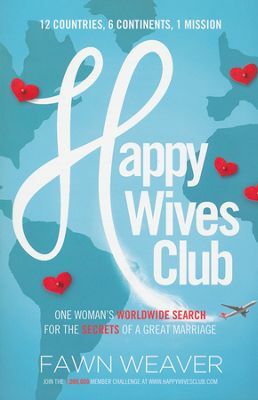 I feel like the focus of the book was the travel, food, and destination instead of the inside scoop of happy marriages. There are definitely golden nuggets of wisdom in every interview. My favorite was the last with Kristine Carlson. You really get a close up look at her relationship with her husband and what made it successful. My least favorite destination was Italy. I was believing from the beginning of the chapter that God was going to provide an amazing interview. Needless to say, that doesn’t happen. I couldn’t help but think of this book as a Christian Eat, Pray, Love. It’s a little heavy on the Eat and a light on the Love. Regardless of my disappointment, I will probably use this book for my ladies book club. It is great for stirring conversation. Beyond that, how fun would it be to make theme nights for discussion groups?? I was given this book free from the publisher with no compensation other than the joy of reading a book.